For a while I’m thinking about this hardware project idea and now I’m opening here to get some opinions. After that maybe I’ll submit it for the Sun SPOT Open Grant Program. What is Walker Sphere? Walker Sphere is a project to made an robot capable with a diferent aproach, without heels, mats, propellers or wings. The main idea is to move only changing its center of gravity. How change its center of gravity? One compartment is filled with a liquid. The liquid is pumped to another compartment and so the compartment got heavier and the sphere moves towards its direction. Why a sphere? We can distribute the mass uniformly in a sphere and it’s shapes make it easier to roll. 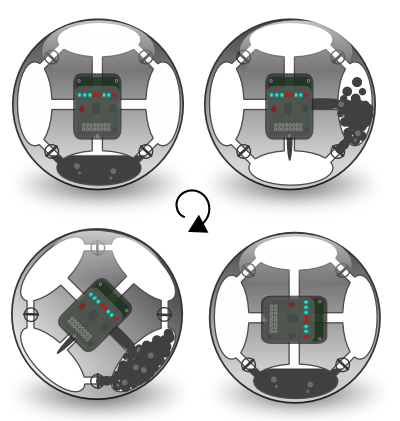 A sphere can encapsulates all components and protect them from the outside world and at the same time all sensors can work, especially using some transparent material for the bark. A broad set of sensors including accelerometers that made possible to know the current state of the sphere. 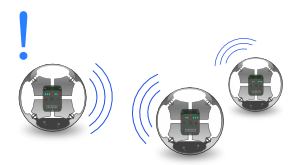 Radio communication that can make possible two or more spheres collaborate to achieve a common task. Open and Free Source JVM, Squawk. It will be free? Yes. I’d like to know more about open and free licenses for hardware projects. How to pump the liquid into the compartments? I don’t know. Have you some good idea? Not using a liquid, use something else. The lighter-than-air gas would already be in the highest compartment – opening the valves isn’t going to make it go anywhere. That has the same problems as heavier-than-air fluids. If you used some sort of magnetic arrangement … a suspension? I’m not thinking that you have mechanical parts, a magnet on rails or anything. You could use electrical fields to move the magnetic stuff. Although this will pose an issue with the electronics… I’m not the one ever planning to build one of these.